Have the 2012 London Olympics lived up to their hype? Were they really THE social media event, as some predicted? Curiosity, NASA’s latest mission to Mars, wins hands down! The 2012 London Olympics were held from July 27 to August 12. 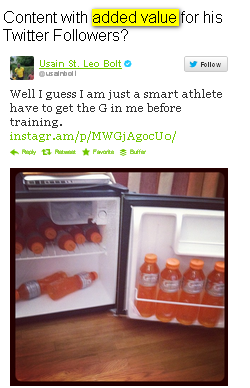 As early as June, Jamaican sprinter and gold medalist Usain Bolt tweeted a photo of a refrigerator full of Gatorade sports drink to his fans. Some Olympic athletes view the games as their best shot to land sponsorships. Nevertheless, one must be careful not to annoy followers with too many commercial messages when using social networks to interact with fans. 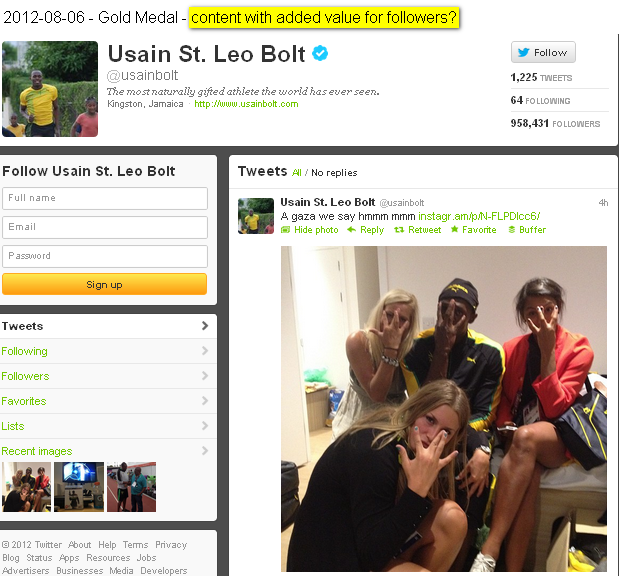 Bolt followed this mantra better than the US team’s Michael Phelps. Besides upsetting fans with too many commercial messages, the increasing use of social media at the Olympics has yielded some unsavoury results. By the way, please sign up for our blog – get the trends that affect your business FIRST! Greek triple jumper Voula Papachristou was expelled from her team after she tweeted comments about African athletes that were deemed racist. Swiss footballer Michel Morganellawas sent home for making racist remarks about Korean players after his team lost (tweet has been deleted, as has his account). Others continue using Twitter and Facebook for relevant and not so relevant messages. The shot below was tweeted by Usain Bolt early Monday morning, after he won the 100-metre goldon August 5 at the London Games. Interesting? Maybe. 2012 Olympics online coverage: Great, average or a joke? 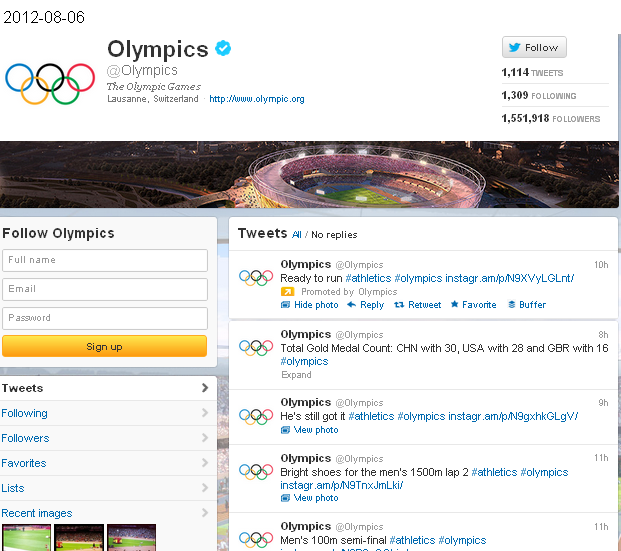 A visit to the Olympics’ official Twitter feed will surprise you. 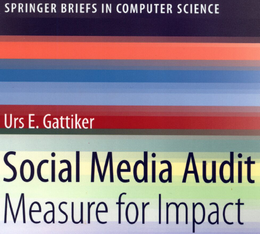 Most tweets fail to add to the information available everywhere else (i.e. BBC and so forth). So where are the gems – the inside stories and snapshots – fans want to see? a) any target audience should be narrow to add value for those who are interested (e.g., track & field fans do not want what swimming enthusiasts do), AND b) unless the content provides additional insights, tidbits or gossip beyond what is offered by mainstream news organizations, why should anybody care? In fact, the Olympics’ YouTube channel states, “To watch the Olympics Live in your country, please visit the list of London 2012 Broadcasters.” Because broadcasters have purchased exclusive rights for their region, the Olympics YouTube may only show past events’ video clips, such as this great clip from the Munich 1972 Olympic Games(Lasse Virén and Emiel Puttemans placing first and second, respectively, in the 10,000-metre race). 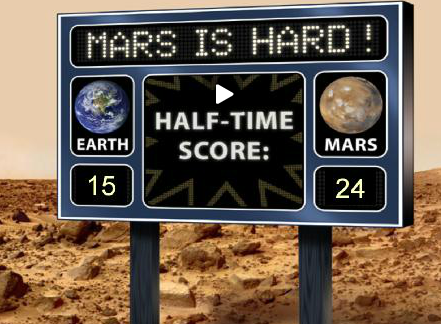 What a difference with NASA’s social media efforts for its latest rover mission to Mars. NASA.gov – the social media hub of the US space agency – offers images, videos and interactive features. If the Curiosity mission interests me in any way, I can sign up for podcasts, videos or blog posts (or all three). Or I can follow it on Twitter, become a fan of its dedicated Facebook page or put it in one of my circles on Google+. 1. Which target audience(s) do we want to reach? 2. What kind of content represents added value for our target audience(s) on Twitter, Facebook, YouTube, blog, podcast channel, etc.? Accordingly, these two cases – Olympcis 2012 versus NASA – illustrate that NASA’s launch of a dedicated channel for each upcoming mission makes it a texbook case for how narrowing your focus empowers you to provide stakeholders with content they feel adds real value (i.e. 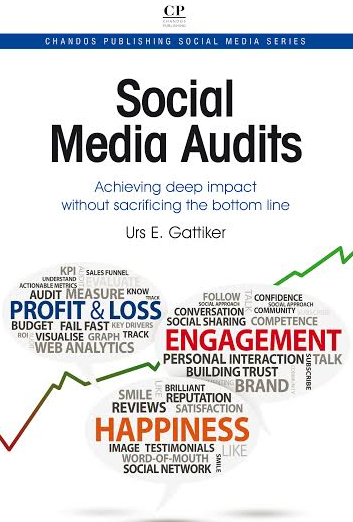 as a result customers/taxpayers give your content the time and attention necessary to consume it). NOT following NASA’s strategy explains why social media failed to make a mark at the London Games. Finally, one key performance indicator(KPI) for commercial messages sent by athletes on behalf of their sponsors is whether they affect my shopping habits – unlikely. Meaning the value of such social sharing is questionable, since it also carries the potential risk of consumer backlash. Your translation is correct but it refers to the Africans in Athens not the athletes in the Olympic Games. When she posted the comment it was announced that the Greek Health Organisation had found the Mosquito of the Nile in Athens. 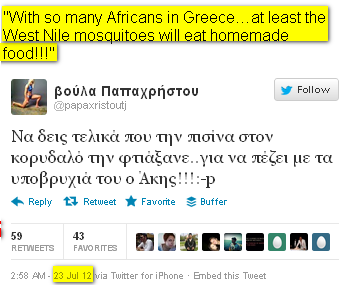 So she made a silly joke that the African Mosquito of the Nile will find enough Africans in Athens to bite, so homefood…! Her comment had nothing to do with the African athletes but with the large number of Africans in Athens. Rules and acceptable behaviours change over time. Would it be censorship if her tweet had been overtly racist, angry, inflammatory and coming from a place of hate? Nevertheless, regarding your point of expulsion from Games going too far, one can make a compelling case that the athlete was a representative on the world stage for her nation and people, and whether she meant it as a joke between friends or not, it was nevertheless ‘uttered’ in the public sphere. I’m sure if another public figure had made such a comment, no matter where they were and the timing, they would also be condemned. Whether Olympic athletes like it or not, they, like celebrities, are under constant scrutiny, both at home and abroad, and considered a reflection of their home culture. Once something is online, you can never completely take it back, and like it or not, as part of their success, these athletes have surrendered some of their privacy in the quest to be the best. The line between the public and private spheres grows ever fainter, and may yet disappear altogether. Fair? Maybe not, but that is the reality of the times we live in – the age of the 24-hour global newscycle. Thanks for your comment and reply to Maria. If I interpret your comment correctly you suggest that the issue is not if it was just or unjust not letting Voula Papachristou compete in the Olympics ….. Your reasoning seems to say: If you are in the limelight, whatever you do will have to withstand public scrutiny. Something polliticans, celebrities and sports stars need to consider before they utter anything on any type of Social Media channel (e.g., Twitter, Facebook, blog post, etc.). I appreciate you taking the time to reply Melanie, thanks so much and I look forward to your next comment. Merci. You are right that the line between public and private shperes grows fainter and may disappear. But this is exactly what worries me about Social Media and their use. Anything could be misinterpeted not only for people in limelight but for anybody and lead to any sort of consequence.. So are we allowed to express our opinion in public? and to what extent? are there limitations? what are the limitations? All this has to do with what we call democracy and what we mean by that. I am not so sure that we can freely express what we think in Social media without the risk of losing our job or getting a fine for using inappropiate language..
@32e7e729a56a57abc3c966b2e35765e3:disqus Thanks for replying back again. Yes I am not sure how @472cc5e0dcbb2e9d850d8321ad6627dc:disqus will reply but here are my five cents on this issue. I believe we were never able to use Social Media freely – same as with e-mail. Whatever becomes a digital file will eventually be seen by somebody that might not be your friend. In turn, it could be used against you. Before you do anything (i.e. text, send an e-mail, post a snapshot) could this possibly become an embarrassment or hurt your career or job prospects down the line? Also, might your partner, children, grand-mother, boss not be amused when they see the message, snapshot or tweet? If the answer is no, don’t do it. Thanks so much for your input on this one. I agree with your comments but have some thoughts I would like to add. I think that some people probably felt that her tweet was inappropriate as far as Africans were concerned and illegal immigrants in Athens in particular. Of course, one can now discuss if the text was inappropriate or not. But beside appropriateness or not….. if it was inappropriate should she because of this not have a chance to compete in London? That seems highly inappropriate or too harsh in my opinion. She trained a lot for this big event and now some bureaucrats decide that she should be punished. No recourse, nothing. Incidentally, did she break any Greek laws? Probably not and even if she did, we are all not guilty until proven otherwise. So you see, we pretty much agree on this one that the punishment was too harsh and an apology would probably have been enough. Maria, I look forward to your next comment. Previous post: Why do infographics fail?